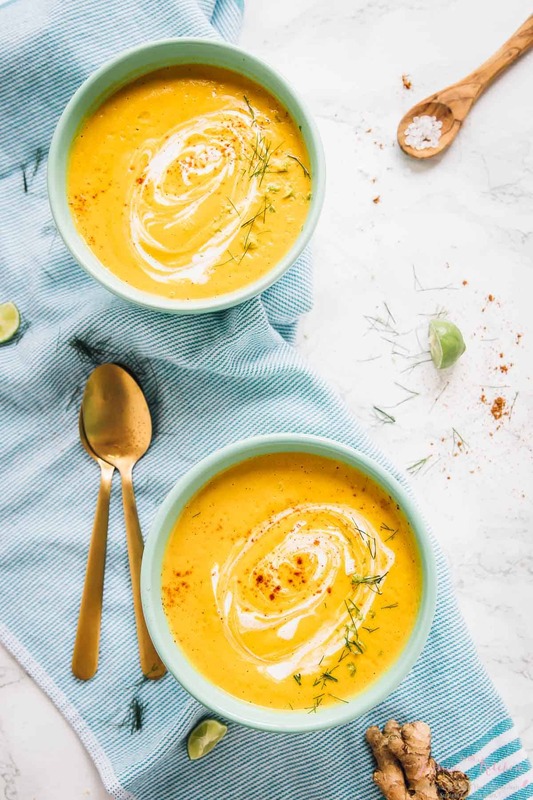 This vegan creamy pumpkin soup is delicious, smooth, and will allow you to taste the flavours of fall in every spoonful. 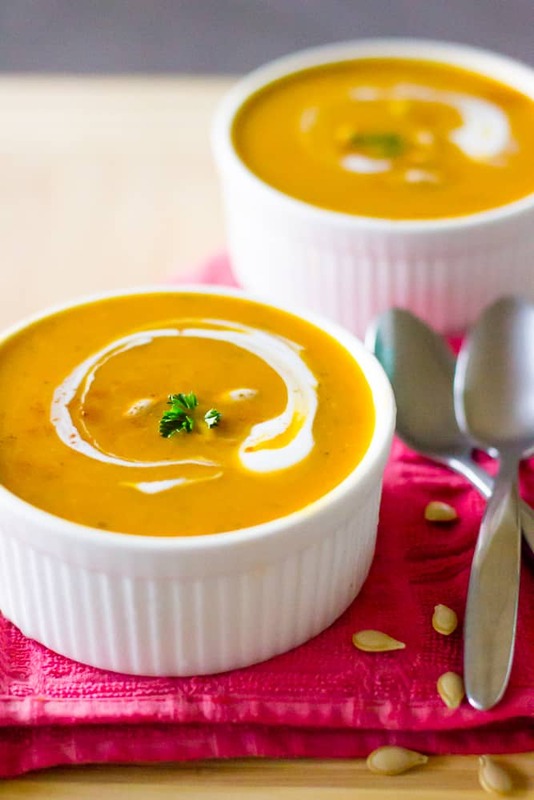 This vegan creamy pumpkin soup is my favourite vegan pumpkin soup of all time: my mother’s recipe. I’ve been having it for years on end, and at no time did I realise it was a vegan soup. This, my friends, is another perfect example of accidental vegan that you’ll be delighted with. My mother has never made this soup with a recipe. Her cooking knowledge came just from cooking from she was a child for her family, which I’ve found is always the purest and most natural way of cooking. I asked her for a recipe from her recipe-less soup and she graciously made it over and over until she got measurements from the soup so that could I share them with you. Here’s to mom! As I watched her make it, I noticed that the all the ingredients put in are really to complement the pumpkin. She kept its pure flavour by adding a little heat (which I reduced majorly since I’ve heard ahem, we Jamaicans may enjoy way more heat than most countries! ), complementary produce and the coconut milk at the end that lends a smooth touch to the soup. She made the original with a whole scotch bonnet pepper, so if you’re up to it and can find it in your market, go ahead! Just please be aware that it is hot, and while we have all gotten used to that heat it can be surprising for a new comer! I subbed in red pepper flakes which as it will be blended down will give you the heat you can adjust for your preference. This soup is incredibly creamy, almost to the point of a bisque, but lest I get chastised by the bisque-aficionados we will go with a creamy soup. 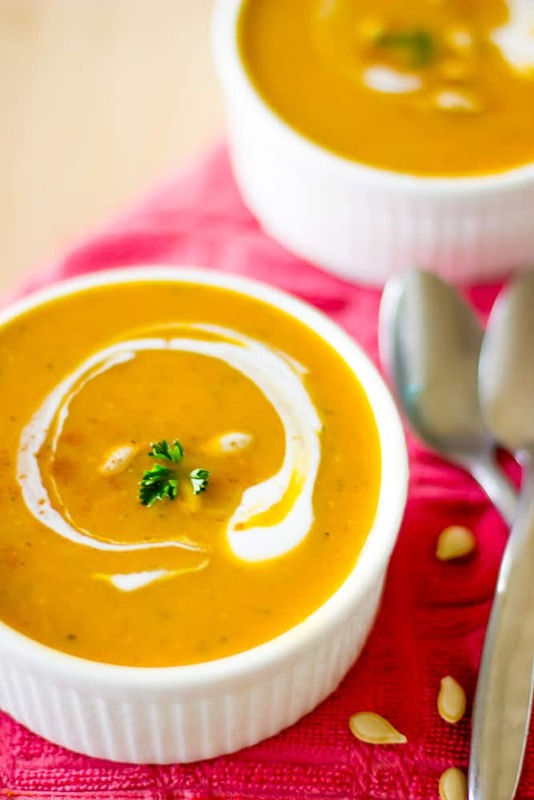 I do hope you not only try this vegan creamy pumpkin soup but enjoy it incredibly. It was made with love and I’m so excited to share one of my mom’s recipes! I can attest to the taste and am always disappointed when there aren’t any leftovers or someone else has gotten to it before I have. 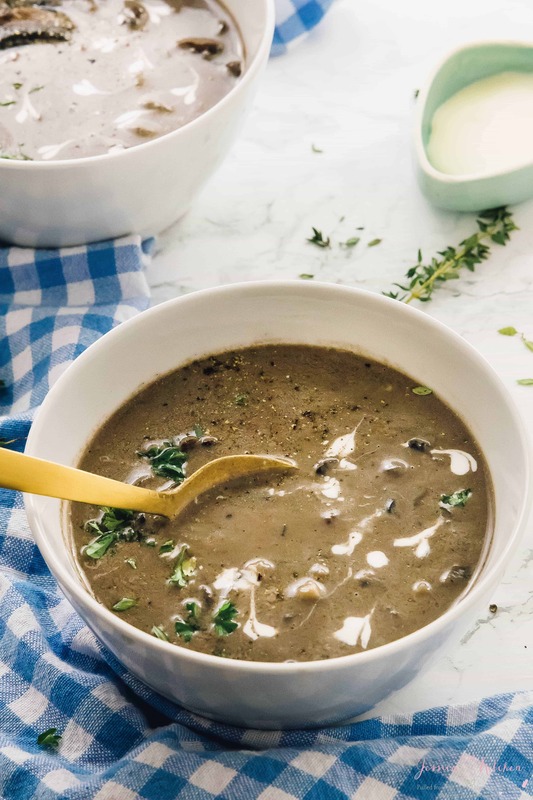 This is the perfect fall soup for those rainy days, which have become every day here, sitting with family or friends and enjoying the weather. P.S. I’ve added my mom’s notes in the recipe! Pour water in a very large pot (so you don't get splashed when blending) and bring to a boil. Place the pumpkin into the pot with salt, reduce the heat the medium, and add all the other ingredients except the Mrs. Dash and coconut milk. Cover the pot and cook for about 20 minutes or until the pumpkin is fork soft. Remove from heat and use your immersion blender and blend all ingredients together. Return to stove on low heat and stir the coconut milk and Mrs. Dash in and simmer uncovered for 5 minutes. This helps to thicken up the soup. Mom’s notes: you can add carrots if you’d like also! This soup is a great way to sneak extra vegetables into your kids meals if they won’t eat them but will drink them. If you try this Vegan Creamy Pumpkin Soup please let me know in the comment section below, or tag me on instagram with the hashtag #jessicainthekitchen! For more exclusive recipes follow me on Instagram AND on Snapchat: jessinkitchen. Everyone is going pumpkin crazy! I absolutely love pumpkin soup 🙂 This looks like it has the perfect balance of seasonings. I bet the coconut milk balances out that little kick just perfectly! It really did! Thanks Melissa! I love how creamy this soup looks, Jessica! I made a similar kind last year but with some veggies and it was amazing! Your recipe sounds delish, too, especially since it’s vegan. Pinned! Wow a whole scotch bonnet pepper! That’s is SPICY! But so delicious I’m sure. This soup looks wonderful and something I totally crave this time of year. Pinned! Yum, looks so creamy and delicious! I know what you mean by “accidental vegan” recipe, I actually grew up eating vegan meals all the time but then I had no idea what Vegan was…Now when I think about it, I’m like wow almost all Indian vegetarian recipes that are made in every household are vegan! Sending this link to my sister who is a pumpkin addict. She’ll go crazy for this. It’s so pretty. I love when a soup can be healthy, filling and gorgeous all at the same time. Great recipe. Thanks so much Kim! I hope she enjoys it! I love this recipe!! I must admit I go heavy on the coconut milk but its, healthy, yummy and guilt free. Makes for great comfort with a bit of flat bread! Thanks Lisa!! Haha nothing is ever wrong with going heavy on coconut milk. Thanks so much for commenting! This looks just fantastic Jessica LOVE it! Prefect for fall! Mmmm, I love soups like this, Jess. I made a sweet potato soup very similar a few months ago but now that it’s fall, I gotta get on the pumpkin train! This would be perfect on a cool evening with a fresh loaf of bread. Beautiful photos too! I love pumpkin soup! I especially am loving your creamy vegan version.. which is strange because I usually love to add heaps of sour cream into mine. Definitely a recipe that I must recreate, thanks for the idea Jessica! Thanks Thalia! If you do I hope you enjoy! I am totally craving soup more than ever right now, Jessica. I wish I could take one of yours and dig in. I’ve made squash and carrot soup but yet to cook with pumpkin. I need to taste this!! Mmmm this looks wonderful! And I love that it’s from your mom 🙂 I really like that there’s coconut milk in it too! 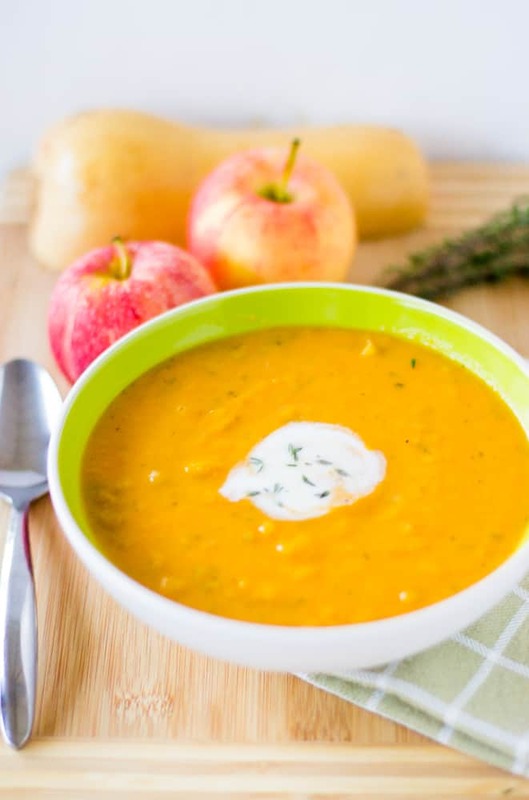 I love pumpkin soup – its my favourite! This looks just wonderful! This recipe is one that I shall be definitely giving a try. Thanks Helen! Oh yes, it definitely does. Your mom is the best! To make this soup again and again so you could share it with us is a labor of love, isn’t it? I love heat, but will probably make it without the scotch bonnet because my husband would like it that way. Loving the addition of coconut milk:) Thanks for the recipe, Jessica(and your mom)! It was really nice of her!! Thanks so much Heather! This soup looks absolutely delicious! I was wondering…..can I substitute canned pumpkin instead of using a pumpkin? If so, which size can? I haven’t tried it but it should work. As long as your amount weighs the same amount as called for in the soup, which is 2.5 pounds on a scale. You may not need to cook it as long since the pumpkin is already puréed. Good luck! Hi Jessica …. I was researching recipes for the wonderful Pumpkin soup I had in Jamaica several years ago and voila! I found your blog…beautiful. I too am a bit of a lazy cook and want to use canned. I can do the math on the pumpkin …I’m guessing about 3 15oz cans…but would 10cups of water still be correct… I’m a coconut milk virgin…so I am venturing into unknown waters for me…thanks in advance for your help. Hey Leslie! So glad you enjoyed time here and the soup! So, you’d want to have 2.4lbs of pumpkin puree weight out of course. I would start with 3 cups water (or veggie broth) and then add from there if you need anymore. That way the soup will not be too watery and you can add ½ cup at a time if it’s like incredibly thick. Of course if you find it’s too thin, just add more puree. I hope that helps! Let me know if you need any additional help. Oh, and you’d still need the same amount of coconut milk! Hi, Jessica! I just discovered your blog. I must say your lovely Mom, cooks from her heart and soul, this is the way I cook, as well and your pumpkin soup is on my list to do. Let’s go Vegan!!! This soup looks interesting since i always have lots of squash. Would like to know what size or how many pounds would be nice. Thanks!! I forgot the word “lbs” so its 2.5 pounds of pumpkin. Hope that helps! !